I started 36 kinds of flowers today, impatiens, petunias, pansies, lobelia, snapdragons, canterbury bells, stock and schizanthus. Was thinking I’d only need 12 seed flats for the pansies, then got to thinking about how much I’d like the other flowers to be blooming if possible and they take a long time from seed to flowering. This year I am starting them a little over 2 weeks earlier. Hard to believe I am in the greenhouse with no coat enjoying the sunshine before the incoming snowstorm…in December no less. I wanted to start a petunia called petunia grandiflora superbissima and couldn’t find any seed in the states. Thompson and Morgan used to have some retail outlets here and then for some reason stopped a couple of years ago. Made me sad, they had some really cool varieties. After doing an internet search for the seed, I found them available from three different seed houses in the UK. Two have agreed to sell them to me, I just hope shipping isn’t horrendous. Here is a picture of this flower. Beautiful. 4 to 5″ blooms, frilly with gorgeous and unusual veining in the throat. They are pinks and purples. They also have white but I haven’t had any that I remember. They come as a mixed color. One of my favorites. Hybrid: These tomatoes are made from crossing two varieties which have characteristics that you want to save in their offspring such as earlier maturity, better yield, improved flavor and disease resistance. Good examples are Juliet, a beautiful, little red grape shaped tomato and Sungold, probably the best cherry tomato that will ever pass your lips. 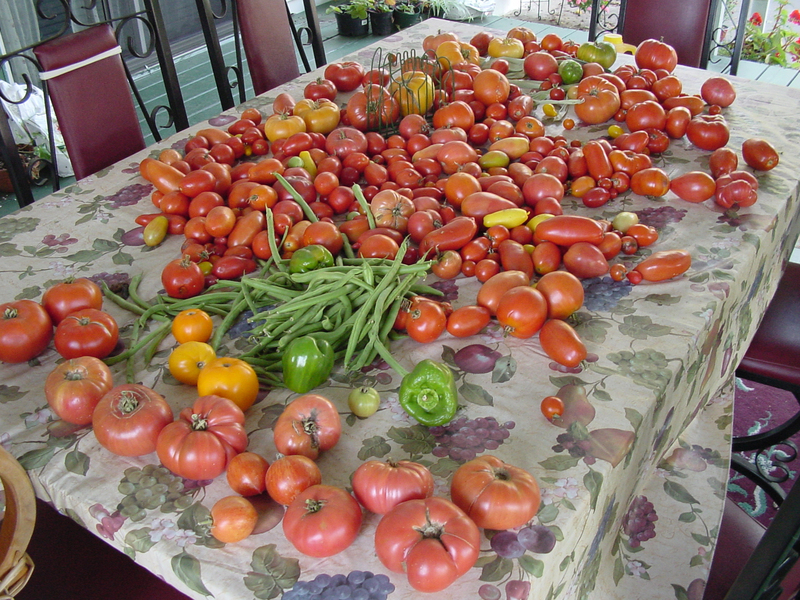 (The tomatoes in the cover picture at the top of my blog are Sungold). Early Girl, Celebrity and Carmello are other hybrids. An F-1 Hybrid means it is the first generation between two different parents. While you can save seed from it, be advised that it will not come back as the same thing you grew the first year. Sometimes folks ask me if hybrids are GMO. They are not and I will devote a post on it later. Open Pollinated: These are tomatoes that have the same parents as themselves. You can save seed and they will come true. All heirlooms are OP and have been saved for generations because of superior qualities like adaptability to a local area and flavor. Heirlooms are another post also. So, yesterday, March 25, I planted around 4000 tomato seeds with the help of two friends, Heidi Eutsler, Kathy Kjelgaard and my lovely husband, Steve. It’s not back breaking (unless you count hunched over for hours) but when you are doing 168 plus varieties, it’s a lot of work. I use a sterile seed germinating mix and sterile containers. This cuts down on the problem of damping off. On Friday, Saturday and Sunday, I transplanted 2000 babies (tomato plants). Now that’s back breaking! Friday night it got really cold and the two heaters we had in the greenhouse didn’t cut the mustard and when I checked on them the next morning, they looked like canned spinach. Not a good thing. I lost 300 plants. The next night, we put in 4 heaters, (space heaters) and ti worked like a charm. Good thing since I had spent the day transplanting. Today, I am going to transplant pepper plants. Early last week I planted some seeds that need longer grow times than others. They are geraniums, lobelia, alyssum, snaps, hollyhocks, petunias, foxglove, stock and impatiens. I also planted 42 “Sungold” tomato seeds in a small cell type of flat as an experiment. (The only drawback is that it needs constant water. These are under lights in the house. My onions (5 kinds) are out in the small greenhouse since they don’t need as much warmth to germinate. Anyways…there are finally signs of life! It’s always exciting to see green coming up in the little flats, The hollyhocks were the first to show themselves, followed by the “Paint Box” geraniums. Yeah! We look at them every morning and night to see what’s new. I divided my seed packets into early, mid and later timeframes to start them. My tomatoes won’t be started until March, the peppers a little earlier. The funny things is, by the end of the season (fall) I am ready to lay down asphalt in the garden. I get so tired of weeding and dragging hose. I swear I’m done with gardening. In january the seed catalogs start coming and I think it’s like having a baby, you forget how much it hurt and can’t wait to do it again. Thats how it is with gardening…OR… maybe it’s just being tired of gray skies and brown lawn.